Leonardo understood light as a dynamic force. The action of light was defined as “percussion” and the reflections of light were analogous to bouncing balls. He investigated the variables that affected the nature of light intensely - the direction that it came from, the angle at which it hit a given object, the relationship between the size of an object and the size or intensity of the light, etc. Each variant, either individually or combined gave rise to an infinite number of effects in nature, which Leonardo tirelessly recorded in his notebooks with the eye of a scientist. No force of nature was of greater significance to painting than the action of light on form. In this portrait of the early 1490s, Leonardo’s knowledge of light enabled him to model the delicate features of the sitter, and achieve an astonishing sense of three-dimensional form in the process. The range and complexity of shadows and highlights across the cheeks, neck and shoulders of the sitter is unprecedented in paintings of the 15th century and represents the perfect synthesis of scientific knowledge and artistic skill. Reverberations are caused by bodies of bright nature with flat and semi-opaque surfaces, which, struck by light like the bounce of a ball, rebound it back to the former object. The sitter is generally identified as Lucrezia Crivelli, mistress of Ludovico Sforza from about 1495. The painting takes its name from a type of band worn across the forehead, known as a Ferronière, which was especially popular in Milan at that time. 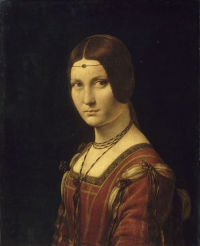 The painting has been executed on a walnut panel that is thought to have originated from the same tree as the Portrait of Cecilia Gallerani (The Lady with the Ermine). The format of the composition, in which a stone parapet separates the viewer from the sitter whose head and upper body only are visible, was especially popular in Northern Europe and may have originated in paintings by earlier Netherlandish artists such as Van Eyck and Rogier Van der Weyden. The sitter’s averted glance testifies to Leonardo’s conception, and calls to mind the Portrait of Cecilia Gallerani (The Lady with the Ermine). The painting is in the main finely executed and in good condition, although some of the more routine details may have been painted by assistants.